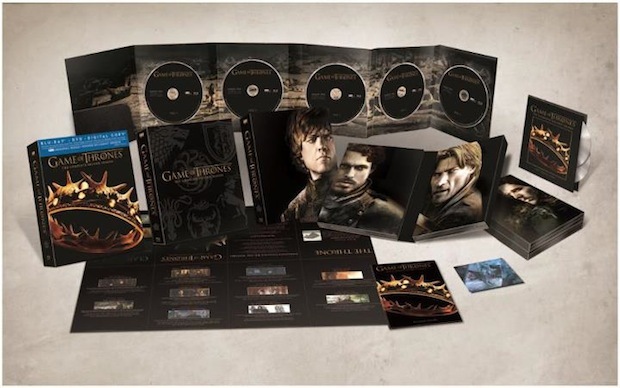 While waiting for season three of Game of Thrones to start airing March 31st, fans of HBO's series will be able to snag the second season on Blu-ray February 19th. Even if you've already seen it (whether on TV, via a borrowed HBO login or...other sources) there should be some new elements with Blu-ray exclusive "HBO Select" features including an interactive "War of the 5 Kings" guide to keep track of who is doing what / where / when, animated histories, in-episode guides with more information on characters (like the iPad companion app did) as they appear and "dragon egg" surprises. Check the press release after the break for a full account of features, or hit Amazon to preorder the 7-disc set (w/ digital copies) for $55.99.